this would all go away. Back in the ‘60s when I was in high school, I was the only one of my friends who had a car. There were four ’55 Chevys in our family, one for each of us. They were all Belaires, except mine. I had a limited edition DelRay, cool and classy, two-tone blue and white, with white leather seats. I named it, “Alexander”. During the summers, we would often go to the drive-in movies once a week. We paid by the carload and would find a spot near the restrooms because we felt safer near the lights. We would buy sackfuls of popcorn and glass bottles of Coke. With the speaker hooked over the open window, we would sit back and enjoy the cartoons, the double feature movies, popcorn, and a girls night out. We loved it. As I drove my friends home, I would pull over before the first drop off and make everyone clean up popcorn and trash to my father’s pristine-car-specifications. 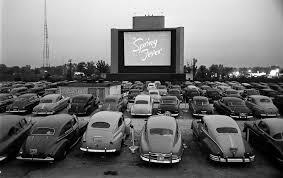 It was something I never thought would go away, but kids today have no idea what drive-ins are. It probably wouldn’t make much sense to them. Why would you drive across town, line up with 100 other cars on rows of bumps, put a speaker (that is attached to a pole) in your window, to watch a movie that you could enjoy with a flick of a finger? But, my grandchildren know, because one lovely summer night we did the drive-in movies . The evening was warm. A blow-up mattress was slipped into the cleaned out back of the pickup truck. We added pillows and blankets. I even managed to get my CrazyCreek camp chair in back. I popped up four batches of my own version of kettle corn. The big bowl nearly took up the space of another person, but there was not a kernel left when the movie was over. The iPad was tied to the opened window of the canopy. I contributed speakers. It took quite a while for us to find places for all the legs and pillows, blankets and popcorn, but when everyone had a good view, we settled in for the feature. Well, settled in until I had to clammer over everyone to run back into the house to retrieve the forgotten speakers. Thank goodness for the ‘pause’ button! Even with all the windows open, the canopy muffled the neighborhood traffic and the movie started at 9:00pm. “Hot Rod” might not have been my first choice, but the kids loved it and the ambience was just as I remembered from my young, drive-in days. Only the technology had changed. And, we didn’t even leave my driveway.